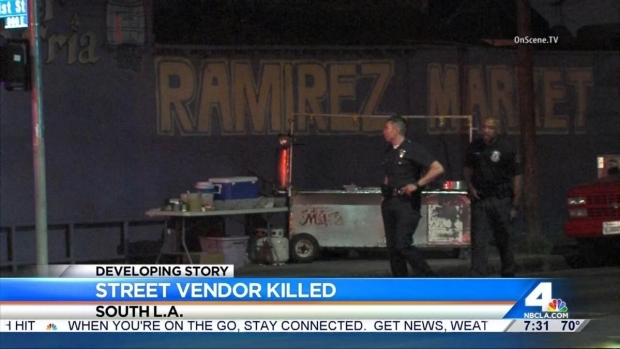 A street vendor was shot dead as he was working at his taco stand in South Los Angeles late Friday, police said. 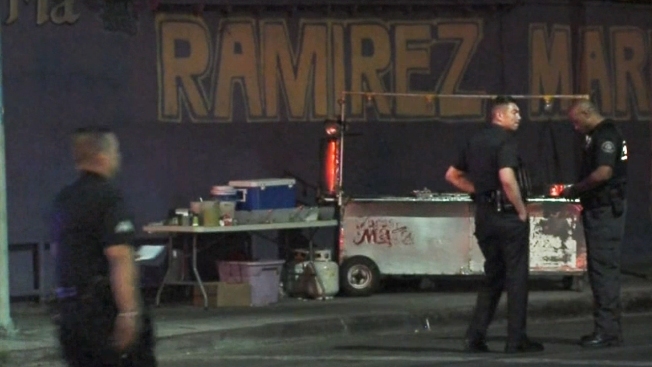 The man was gunned down at the intersection of East 51st Street and McKinley Avenue just before 11 p.m., a Los Angeles Police Department spokesman said. Two men are thought to have been involved in the slaying, which investigators believe occurred during a robbery attempt. The victim, who is well known to the local community and believed to have been in his late 20s, died at the scene, police said. Officers have been speaking to witnesses and canvassed the area overnight. A description of the suspected gunmen has yet to be released. Investigators were in the process of obtaining surveillance footage from the scene. Community members were lighting candles for a street vendor killed in a shooting. Melissa Etezadi reports from South LA for Today in LA on Saturday, June 20, 2015.